The Twilight Zone aired between 1959 and 1964, and it became one of America's iconic television shows. Although the program ended long ago, the show lives on today ... on the radio. 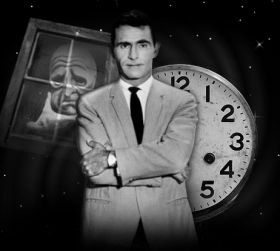 Airing on 200 stations across the US, Twilight Zone Radio dramatizes Rod Serling's classic scripts for today's radio audiences. And it does it with help of actor Stacy Keach, the show's host, and celebrities (Jason Alexander, Ed Begley Jr., etc.) playing lead roles in the dramas. You can catch the show on the radio (find your local radio station here). Or, right now, you can download three free episodes of past shows. Each runs about 40 minutes, and, if you find yourself hungering for more, you can always purchase individual episodes from the Twilight Zone Radio archive for $1.95. I love the show . I watch the show with my parents . I love the show back in the 60’s . I love this show . I watched the show un the 60’s with my parentes .
! Fantastic ! I love the shows . I love the show’s . I love the show’s . Never missed the then I was younger . I love the show . Never missed it in the 60’s with parents. Gistaria de receber episódios gratuitos…de twilight zone 1959/1964.